Feeding high protein “Casein” – (this is used by human Weight Lifters to build muscle mass). CASEIN : Is a purified protein and is water insoluble. It is commonly used by bodybuilders as a slow-digesting source of amino acids. Higher Protein levels at correct time, improves breeding. Casein is found in "Birdcare’s" Pro-boost + super Max = High protein diet. feeding the young until they fledge. [from 25% to 10 – 12 ½%] then phase out altogether. They don’t need a rise in protein levels again until the following Spring and the new breeding season. 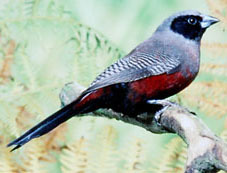 Birds are much fitter and better for breeding if they don’t carry too much weight prior to mating. DO NOT OVERFEED – fat hens difficult to breed from. Higher Protein levels not needed until chicks due to hatch. During winter use wild seeds etc., to bring into Breeding fitness. They are paired up again for the new season at the back-end of Feb.
Mini mealworms x1 per week (while rearing – if they will eat them – not all will). Some will eat Frozen worms (pinkies & Buffalo Worms) – put into egg food when frozen but NOT if fresh ones - makes food soggy! Approx £7 per box (price 2007 - poss more now) – 20 boxes will last one Breeding Season. Not all birds like it or will eat it. Wash well and soak in water mixed with Aviclens – then soak. Potent Brew in the water used to mix Egg Food. Use EMP or any good quality Egg-food. Once per week use Bogena Universal Soft Food in a separate dish. Avi-clens mixed in the Drinking water and in the water he used for “Soak Seed” – ½ tspoon to 2 litres. Daily Essentials 2 in Water for Vitamin content. See amounts etc., on side of tub. All mixed tog. and kept dry in an airtight tub. Lights are on from 6am – 10pm and fade in and out in Breeding Season. Use ordinary bulbs, as the specialized bulbs have a limited life-span of usefulness. Use double Breeders 4ft long x 16”deep x 18” high. Narrow bars to prevent escape. 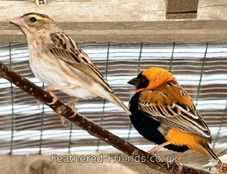 Allow them into an Aviary to Fly them in the summer for exercise but then you can’t control the environment and they do need humidity. Esp. during hot weather. you can get from Pet stalls. Provides coconut fibre or a Sisal mix. They seem to like the lighter colours. 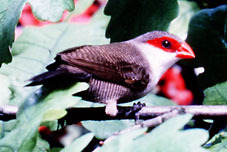 Use Anti-mite “Blast-off” from Bird Care Co. in bottom of nest boxes. You need approx. 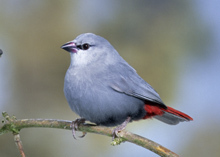 6 pairs of each variety of Waxbill to create a Genepool. Minimum necessary is 2 pairs per each variety kept. Bengalese are used for Fostering. Use PAIRS 1yr old +. 6 eggs max. 3 – 4 better. All chicks should be close rung.